You have many options for helping your child maintain a healthy smile. One effective way to reduce cavities is to have a dental sealant applied by Dr. Evanson sometime between the ages of 5 and 14. This plastic coating protects the biting surface of molars, preventing particles from settling in the tiny cracks and fissures there. The problem is that dental sealants contain bisphenol-A, or BPA. 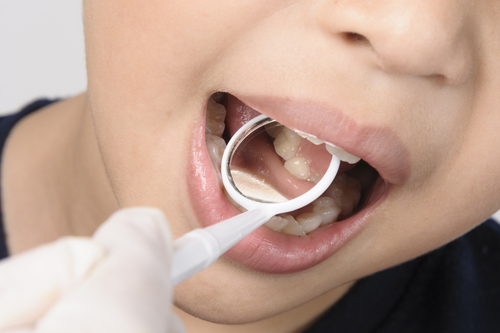 Like any concerned parent, this may have you wondering: are dental sealants safe? Fortunately, a 2016 study from the American Dental Association Professional Product Review (ADA PPR) addresses the issue, so you can put your concerns to rest. The Professional Product Review launched in 2006 under the direction of the American Dental Association Council on Scientific Affairs. The intent of the ADA PPR is to provide accurate, up-to-date dental information compiled from the best available sources. Content is meant to be unbiased, free of jargon, and scientifically credible. Consumers are encouraged to suggest categories for the ADA PPR to review. The issue of dental sealants became a primary topic in the August 2016 edition of the ADA Professional Product Review. The findings are outlined here. Are Dental Sealants Safe? What About BPA Exposure? BPA is a trigger word that has struck fear into the hearts of parents since the possible health risks of this plastic chemical came to the forefront in 2008. Suddenly, bottles, sippy cups, and other hardened plastics used in everyday life became a threat. Everyone knows to look for “BPA-free” on the label of plastic products, so how are dental sealants safe if they contain BPA? As the PPR discovered, the amount of BPA in a product makes all the difference. In the study, ADA Science Institute staff tested 12 dental sealants currently used by dentists in the US. The goal was to pinpoint the amount of BPA released from these products and whether the level endangers children who have dental sealants in their mouth. The findings were definitive. A 6-year-old with dental sealants may be exposed to 0.09 nanograms of BPA per day, which is well below the Environmental Protection Agency’s proposed limit of 1 million nanograms of exposure for a child per day. The average 6-year-old is exposed to much more BPA in foods, drinks, cosmetics, and even cash register receipts than they are from the minuscule amount used in dental sealants. If you still struggle with the mere presence of BPA in dental sealants, consider how the benefits outweigh your child’s minimal BPA exposure. For instance, according to The Huffington Post, 10-year-olds who have had dental sealants for five years have 50 percent less tooth decay on their molar biting surfaces than children who brush regularly. This reduced level of decay prevents cavities and subsequent fillings and crowns. Rinse for 20 seconds with room-temperature water to reduce BPA exposure by about 68 percent. Rub the treated surfaces with a cotton swab to reduce BPA exposure by about 87 percent. Ask your dentist to rub the sealant area with soft-grit pumice on either a cotton ball or in a prophy cup. This is the most effective option, reducing BPA exposure by up to 95 percent. At Evanson DDS, our goal is to provide the whole family with safe, affordable, and effective dental care. By focusing on preventative dentistry – like choosing to have dental sealants applied to your child’s teeth – you can keep future dental problems at bay. If you’re still wondering are dental sealants safe, please contact Evanson DDS online or call our Parker office at (720) 409-0008. We’ll answer any remaining questions you have and help you make the right choice for your child’s health.